Our Autumn Seasonal beer is a traditional Maerzen style lager. We use eight types of imported German malts and four hop varieties to create this amber-colored fest beer. It's hard to tell the month of the date code because the second number is rubbed off...it looks like it says 04/19/18. Appearance: It has a medium copper and golden brown body with a short off-white, slightly tan, head. It has moderate retention but maintains a low cap. Aroma: There is a light "lager" aroma and a touch of caramel in the back. Taste: It has a light toasted flavor with just a hint of charred nuts. There is a bit of a fruity flavor in the middle that is similar to grape but certainly does not taste quite like it. It finishes with more of the lightly toasted flavor. Mouthfeel: It floats on the lower side of medium bodied. It is drinkable and it feels fairly clean. It is a bit low on carbonation. Overall: It is a fairly average tasting Oktoberfest without any noteworthy or overly negative traits. It is easy to drink and it does have decent flavor so it is certainly worth drinking, but I probably wouldn't go out and buy it again. It would go well with a sandwich or something with meats and cheese. Pours a medium-dark amber with a negligible head. Smells... faint? Some malt spice in there. Minimal hops. But very tame. Tastes a little tangy. Very malty. Vaguely British. Some enjoyable malt complexity up front, moving into a fruity middle that's similar to a heavy American adjunct, and finishing like soda water. This style, man. At its best, it's the best. At its most middling, which this is an example of, there's nothing off putting but it's also almost as bland as Michelob Amber Bock--heavier malt complexities than a macro adjunct, but overall nothing even close to memorable. Look: amber copper. Thin sudsy head that dissipated. Smell: just a little lager funk. Little else. Taste: malty. Bready. Average to style. Pours a clean and clear deep copper color with a massive creamy tan-colored head. Bubbly, moderate rings of lacing. Good looker. Lots of caramelized malt and spicy hops. Bold and sweet. Toasted and caramel coated malt flavors. Spicy and floral hops, buttery sweet. Medium bodied with bite and some alcohol strength. I like a Marzen with bite, this delivers. The furshlugginger Bottle Backlog MUST die in 2016! Such is the current battle cry of The CANQuest (tm) as I attempt to eradicate the backlog of bottles hanging around Chez Woody. This one either came from my (usually) local, in-person trader who has since fled south for the winter or from The Friendly Greek Bottle Shop, purveyors of bottles, CANs & draft beer here in LanCA[N]ster, PA.
From the bottle: "Our Autumn Seasonal beer is a traditional Maerzen style lager. We use eight types of imported German malts and four hop varieties to create this amber-colored fest beer." It's Pop! the top time, kids! A moderately heavy-handed pour raised two-plus fingers of foamy, tawny head with decent retention. Color was Deep Amber/Light Copper to Copper (SRM = > 13, < 17) with NE-quality clarity. Nose was really malty-sweet, almost like syrup or brown bread before baking. Mouthfeel was medium. The taste was not as sweet as the nose had led me to expect. Instead, it was more bready than sugary and I breathed a sigh of relief. I am not a sweet kind of fellow and such beers really put me off. That said, I was still not a huge fan of this one, either. I have had drier Maerzens/Oc/ktoberfest biers and this was sweeter than I really like. Finish was semi-sweet, malty, but offset (not quite balanced) by the hops. Deep amber/reddish color with a creamy off-white head that diminishes after the pour. Good clarity. Bready, toasted malt, and caramel aroma. Light herbal hops mixed in. Flavor is balanced towards the malt, as it should be, but the finish is a little too sweet and bitter. Medium bodied but slightly cloying and a little too rich. 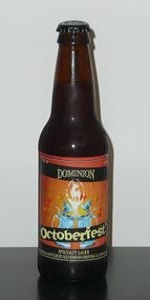 The bottle description says eight types of malt and four types of hops were used to brew this beer. It’s probably a little too much of both. There are no off-flavors, but it could be improved by simplifying the ingredients and focusing more on being a clean lager instead of one with a complex malt profile. Look: Amber red; Dissipating bright white hea. No noticeable lacing. Taste: Malty, grapey: sweet. No real bitterness. Somewhat doppelbock-like. Perhaps a touch more alcohol than some others as well. Feel: round / full mouthfeel. No real bite. Overall: As someone who likes beer on the sweeter side, I found this to be a pretty decent pour. I would put it near the top of the list, in terms of the american marzens I've had this fall.